Split overhaul balls are a quick and easy way to add weight to wire rope. Because they are split--the two halves fasten with bolts--they are easily installed at any point on the line. 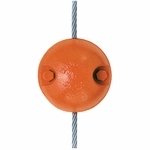 Choose from four sizes, from 1/4" up to 7/8" wire rope and weights from 15 - 100 lbs. Not sure how much weight you need to add to your line? Check out the very handy Crosby Overhaul Weight Calculator on the right.